Hydrofarm's windowsill heat mat is perfect for veteran growers, beginners, and children too. It is the perfect size for small growing spaces, and improves germination by warming the root area 10-20°F over ambient temperature. By warming the roots, you increase your growing success, as this mat will maintain a controlled temperature all season long. If you ever dreamed of growing a windowsill container garden but found the area just a bit too drafty, add this heat mat and you'll be ready to get growing. View More In Heating Quilts & Mats. If you have any questions about this product by Jump Start, contact us by completing and submitting the form below. If you are looking for a specif part number, please include it with your message. 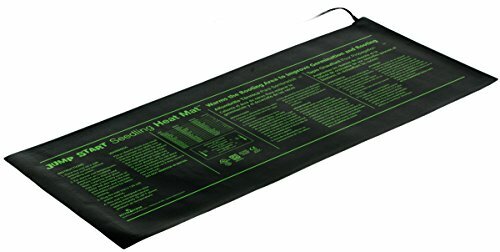 Ken-Bar Kwik Grow 2 Tray Seed Starting Heat Mat 22" x 21"